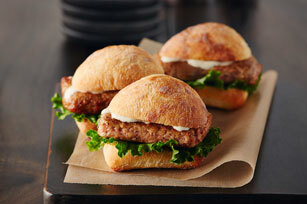 These delicious juicy chicken sliders are made with Caesar dressing, bacon and crushed croutons. Mix chicken, crushed croutons, bacon and 2 Tbsp dressing just until blended; shape into 8 patties. Place on parchment-covered baking sheet. Bake 20 min. or until done (175°F). Fill buns with burgers; drizzle with remaining dressing. Fill freezer-weight resealable plastic bag with chicken mixture; press bag to flatten chicken mixture into even layer. Use skewer to divide chicken mixture into patties by placing skewer on top of bag, then pressing skewer into chicken mixture in bag to divide into 8 portions. Cut bag open with kitchen shears. Transfer chicken patties to parchment-covered baking sheet with spatula. Add your favourite burger toppings, such as lettuce, sliced onions and tomatoes, to sandwiches. Prepare using 1 (350 g) baguette, split and cut into 8 pieces.